Posted January 12, 2010 in Articles and Quetico Park People. With the opening of Highway 11 from Thunder Bay to Atikokan in 1956, there was, for the first time, road access to the northern part of Quetico Park. One of the people who drove that road and started a canoe trip at French Lake that summer was a young woman named Shirley Peruniak. That canoe trip was the beginning of a love affair with Quetico that is still going strong today. 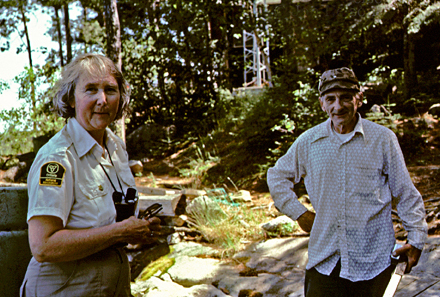 Shirley officially retired sixteen years ago after nineteen years as a Quetico Park naturalist. Fortunately for the park, even though she has retired, her ongoing quest to explore and gather information about Quetico continues. 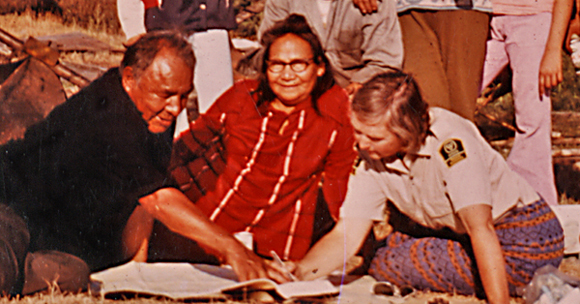 Her research into Quetico’s past culminated in the publication of Quetico Provincial Park: An Illustrated History in 2000. Dave Elder, a former Quetico Park superintendent, calls Shirley the “heart and soul of Quetico”. Everybody who knows Shirley would agree with this assessment of her. She has definitely poured her heart and soul into her work in Quetico and her impact on co-workers in the park and park visitors has been profound. Shirley’s obvious enthusiasm and zest for Quetico comes from believing she is working in the greatest canoe park in the world. Shirley is an accomplished naturalist and her records of birds and plants have increased our knowledge of Quetico’s natural history. She has also interviewed hundreds of people who have worked in, lived in, and travelled through Quetico. These interviews have added greatly to what is known about Quetico’s human history. Through her writings and her work as a part interpreter, Quetico’s present and past have been made more accessible to park visitors. Shirley moved to Atikokan in 1959 with her husband and two young children. People who knew Shirley when she first moved to Atikokan remember her passion for identifying the plants and animals she encountered. She grew up in southern Ontario and Northern Ontario was home to species she was unfamiliar with. Before the arrival of Shan Walshe, Quetico Park’s first naturalist in 1971, Shirley would send plants or animals she couldn’t identify to specialists she knew in Thunder Bay and Toronto. Jane Pringle, a long-time friend of Shirley’s, said that one of her first memories of Shirley is having her excitedly show her a shrew that she had found and preserved in her freezer. Shirley had been an active bird watcher in southern Ontario and she immediately put her knowledge of birds to work. 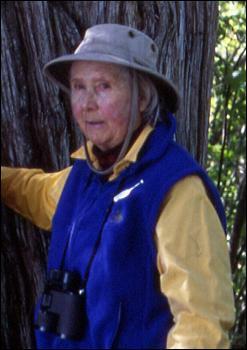 She started the Breeding Bird Census in 1959 and has conducted it every year since. She also initiated the Christmas Bird Count for Atikokan in 1960, and wrote a two-part article called “Birds of the Atikokan Area” for the Canadian Field Biologist. observing and writing about birds, her canoeing experience, and her interest in the local flora and fauna gave her strong qualifications for the job. She had the good fortune to begin her work in Quetico with two exceptional naturalists. Shan Walshe, the head naturalist, was just beginning his work on a book about the plants of Quetico. Doug Haddow was an avid, knowledgeable naturalist who had special interests in birds and archaeology. He also accompanied and assisted Shan on his excursions around the park identifying and recording plants. Shirley conducted the summer programs at French Lake while Shan and Doug spent most of their time on canoe trips. She enjoyed doing the programs at the outdoor amphitheatre and researching a variety of topics in preparation for them. The presentations convinced her that she needed more first-hand experience in the park to complement the information she had compiled. Eventually, she convinced the park superintendent that she should also be given time to take trips into the park. The next summer, Shan and Doug started sharing the presentations. Quetico then had three naturalists committed to exploring Quetico and sharing their acquired information with park visitors. The 1970’s were, in general, a time of good funding for Quetico and park naturalists had the funding and support to do their field work. Shan, Doug and Shirley had diverse, but overlapping, interests and they eagerly put their skills to work. They were as apt to be found on canoe trips as at their desks. An amazing amount of information on Quetico’s plants, birds, mammals, butterflies, mushrooms, geology and history was collected during this period. Andrea Allison, the Quetico Park librarian, now has the daunting task of cataloguing more than 15 000 slides, most of which were taken during this period. Shirley began her quest for information on Quetico’s past during her first winter on the job. After her busy first summer working on the summer programs, she went into the winter realizing she wanted to find out more about the park’s history. She talked to numerous local people who had connections to the park as loggers, trappers, and park rangers. Because she had to ask people to slow down or repeat things when she couldn’t take notes fast enough, Shirley found that these interviews sometimes lacked spontaneity. She then switched to using a small cassette tape recorder to allow conversations to flow more freely. From the beginning, Shirley decided to learn about Quetico’s past by talking to people directly involved. She has a B.A. in Canadian history, but she found that she learned more history by talking to local people than she did by reading books. In her endeavours to find out more about what had occurred in Quetico’s recent pas, she has interviewed hundreds of people. She has talked to local loggers about logging, to poachers about poaching in Quetico, to bush pilots about flying in Quetico, and to park rangers about working in the park. In 1976, Shirley conducted her first long, taped interview. She interviewed Bob Wells, a Quetico park ranger from 1927 to 1940. He worked mainly out of Basswood Lake at a time when all park rangers were male and worked in pairs. Six pairs of rangers patrolled the park by canoe in summer and by snowshoe in the winter. It was a time when canoeists were few, but logging was proceeding at a rapid rate and poaching was common. When discussing how they showshoed from cabin to cabin during the winter months while patrolling for poachers, he said that two of the rangers sometimes used skis rather than snowshoes. Oscar Fredrickson was from Finland, and another famous ranger, John Hendrickson, was an old country Swede. I’ll tell you these guys could cross Quetico in two days, they were terrific skiers. . . . Oscar had snowshoes and Hendrickson had snowshoes, but if they were going to make a long hop somewhere they’d take the skis. They could go a long way in a short time. Prior to reading this, I was unaware that park rangers used skis, and thought that cross-country skiing in this area was a recent phenomenon. It was obvious from the first interview, that Shirley has a knack for getting people to talk freely about their past. Occasionally, stories come out that surprised even her. Former park rangers have talked about trapping illegally in Quetico while they were being paid to stop that very thing. People have told her about using dynamite to shorten portages and about guiding celebrities like Mae West and Charles Lindbergh into the park. However, her interviews made it clear that Quetico’s real celebrities aren’t the park visitors, but the men and women who have lived near and worked in the park. Quetico has its own home-grown heroes and has no need to import others. Chief Blackstone, John Boshey, Dorothy Powell and Oscar Fredrickson are some of the individuals who lived in or on the edges of Quetico and whose lives had a major impact on those around them. Shirley has been persistent and tireless in seeking out people who have lived and worked in Quetico. From them, she has learned about others who would have additional information. In this way, she has built up an extensive circle of informants. She gives of herself and her knowledge so completely that the barriers many knowledgeable people put up are absent in Shirley’s case. Her quiet, non-threatening manner and obvious love of Quetico draw out memories that people thought they had forgotten. Shirley with Irv Benson on Saganaga Lake in the early 1980's. Shirley’s interviews have grown to over 300 hours of tapes, a treasure trove of information that has been already used by many writers and researchers. They will undoubtedly be used to an even greater extent in the years to come. Many of the pamphlets about Quetico, such as “Fascinating Facts” amd “Lake Names”, are based predominantly on Shirley’s research. She has also written numerous articles, including those that have appeared for decades in the Quetico Provincial Park tabloid. A photo history of Quetico, a project started by Shan Walshe and his wife Margie in the 1970’s, has been greatly expanded by Shirley. Photo albums on a variety of topics, such as aviation history and park rangers, have been compiled by Shirley and are on display at French Lake. Each ranger station also has albums detailing the history of its area of the park. These albums enable visitors to relive parts of Quetico’s colourful past. It seems incredible that some of the earliest non-native permanent settlers in the Quetico area, such as Benny Ambrose, Art Madsen, Jock Richardson, and Russell Blankenberg, were still alive when Shirley began doing interviews. All of these people arrived in the Saganaga Lake area shortly after World War I and stayed to create their homes. Shirley’s interviews with them detail life at a time when the areas was wilderness, but not yet a restricted wilderness. There exists, however, a human history that extends far back beyond the first Europeans in the area. Native American history in Quetico goes back at least 9000 years. Shirley talked to many archaeologists and read archaeological reports about the evidence for native people in Quetico. However, in typical Shirley fashion, she decided that the best way to learn about Quetico’s native history was to talk to native people who lived in the area. This approach doesn’t sound exactly revolutionary today, but 35 years ago, it was unusual. Unfortunately, it still is uncommon to ask native people for their interpretation of what has happened to them. Shirley began by talking to Elders at Lac La Croix and listened and learned from them. From John Boshey, she learned about his life on Poobah Lake in the 1920’s and 1930’s. She talked to Roy Burnside, Bill Atatise, Eddie Atatise, and other Lac La Croix Elders and slowly built up a better understanding of the Lac La Croix people. Working with people from Lac La Croix, they compiled photo albums that chronicle their history from the turn of the century. Shirley didn’t begin working with the people of Lac La Croix because of a shift in government policy or because of direction she received from others. She began because she was interested in finding out more about the human history of Quetico. What began thirty years ago as a logical extension of her interest in Quetico’s past has led to many strong friendships with people from Lac La Croix. Her work has also helped to open a dialogue between the Ontario government and the Lac La Croix First Nation. From all of her travelling companions in Quetico, it is reported that Shirley is now known for travelling lightly. Freeze-dried foods and ultra-light gear are not high on herlist of essentials for a canoe trip. She is willing to work hard on portages in order to sleep comfortably and eat real fruits and vegetables. Scottish wool blankets, a hot water bottle, and a thick foam sleeping pad are all present in her pack. On one trip, she took several cabbages for soup. She used one and gave the rest a nice scenic trip through Quetico. Shirley is widely known for her homemade cookies that are simply known as “Shirley cookies”. They would never be confused with anemic, generic, store-bought cookies. Hers are like chocolate chip cookies on steroids, with added ingredients of walnuts, dried fruit and gumdrops. The presence of these cookies has frequently worked to Shirley’s advantage, and she unabashedly uses them as bribery. Portage crew go out of their way to monitor eagle and osprey nests in return for Shirley Cookies. She also gets people to go outside in -30&int; weather to do the Christmas Bird Count by casually mentioning that she will bring the cookies. Shirley delights in finding the unique or unusual, whether it’s a plant, a mushroom, an obscure fact about a former park ranger, or the date Charles Lindbergh took a canoe trip into Quetico. She also delights in the common everyday things. The song of the white-throated sparrow, the call of spring peepers along the French River, or the call of a loon all bring a glint to her eye. You can see this when she explains the difference between a red pine and a white pine to a child, or identifies the call of a Connecticut warbler to a non-birder like myself. Shirley has added volumes to the recorded knowledge of Quetico rather than just reorganizing what was already known. She has sought out and interviewed hundreds of people whose lives have had an impact on the park. Her work has greatly increased our understanding of the impact that people have had on Quetico and that Quetico has had on people. She has done this with a grace and tenacity that is truly remarkable. When Shirley returns to Quetico this summer, it will be fifty-four years since she first launched her canoe at French Lake. 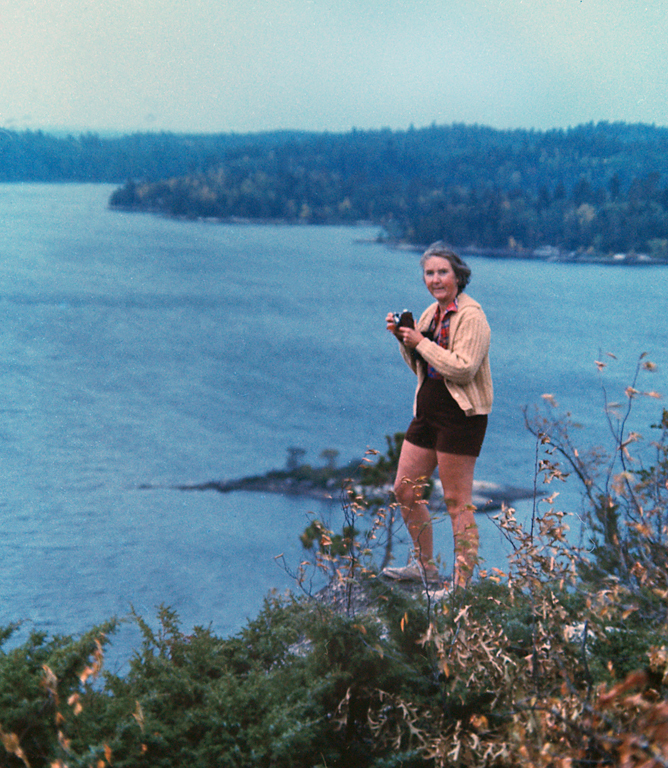 In the intervening years, she has persistently and joyfully explored both the landscape and literature of Quetico. In her quiet, unassuming way, she expanded and altered the scope of the naturalist program in Quetico Park. She then wrote a book that added a human dimension to the wilderness for which Quetico Park is known. Through her decades of devotion to Quetico, Shirley has become Quetico’s most respected Elder. Shirley is highly respected both for what she has accomplished and how she has accomplished it. In recognition of her work, Shirley was awarded the province’s highest honour – the Order of Ontario – on January 28, 2010. I am so very proud that Quetico has recognize this precious woman who we love and adore in Sharbot Lake. Shirley has been the driving force to gather local history, stories from our seniors and artifacts that would have been lost if not for her. Sharbot Lake has been her home and we shared her with the Park and experinced all the same dedication and effort at home as you did at work. We love her very much!! She is very deserving of this high honour of the Order of Ontario, truly a giving humble “great” woman. Councillor for Central Frontenac Township and life long friend. As a descendant of members of the Lac La Croix First Nation, and the granddaughter of Dorothy Powell, I grew up hearing stories of Benny Ambrose, Jock Richardson, and the rest of the Saganaga Lake settlers. I was fortunate to know Shirley, and I’m thankful that her fascinating works include my family’s history.